We recently had a requirement for users to complete a short assessment, to record which users passed, and for those who did, to receive a certificate. How to then pass the details into a certificate is achieved using Google Apps Script. This script populates a new form, which uses the Form Publisher add-on and submits it. The script will only process those rows without the flag "CERTIFICATE_CREATED" in column E, once it has processed that row, it adds that text, to prevent duplicates being created. In the background, when the script populates the user name, assessment and date into the next form and submits it. Form Publisher merges the fields into a certificate template I set up in Google Slides, saves the certificate as a pdf, and then emails it to the person who took the test. 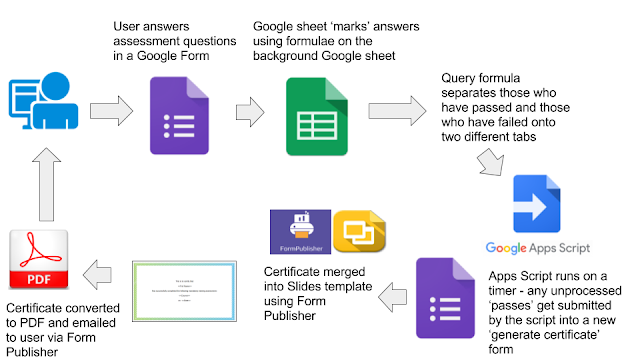 A useful feature of using a second form, processed by a script, is that sheets for different assessments / courses can use that same template and same 'certificate generator' form to create appropriate certificates. All that is needed is the script in a background collector sheet to populate that form with the required data. This solution came about from a requirement we had for colleagues to easily add updates and comments to a monthly report which was itself refreshed each month with new data. As the data changed in the report it was necessary to find a way to get the existing comments to be kept and to show against the appropriate matching lines in the new data set. To do this, I used an Awesome Table, with a sidebar, linked to a form which could be toggled to show and hide. The form has a few fields which are pre-filled depending on the line of data, so that the comments then get matched up and shown in the table. with a similar formula on the form result sheet, any matching results can be brought in with a query, but with a join function, to combine multiple matching entries, sorting the matching comments by most recent. The returned column combines the date stamp, formatted to show just the date, with the comment, and some HTML line breaks so that this displays well in the Awesome Table, which was obtained by the following formula. what would appear in the sidebar, which is an iframe of the form, prefilling three of the fields using the data in the rows. Please feel free to take a copy. This script aims to give a workaround for that - when a user submits a form, the form entry is assigned a unique reference, a Drive folder is created with that reference, and they receive an email containing a link to that folder to upload related documentation. Using an Awesome table, the link to the folder as well as the details in the form can be displayed together to make it easy to match documents to form items. To being with, I created a Google form, and a Google sheet to collect the information. // Define column number unique reference. Array starts at 0. Both scripts should be set to trigger when the form submits. In my example above in the 'Advanced parameters', the Awesome Table is set to only show rows where A is not blank, so the method for removing any unwanted records from displaying in the Awesome table should just be a matter of deleting the timestamp for the unwanted row in the sheet. -working hyperlinks in the text. While these features are in the front end, in the back, as the fields are all still Google form fields, there is functionality in the collecting Google sheet so that when the form is submitted, Google Apps Scripts run, to provide an edit link, emailing the recipient with confirmation of the data and a link to edit, and a set timer so that the recipient is contacted every x months to review their data and amend if necessary. As normal with Google sheets, an add-on can alert the owners of the sheet when a form is submitted, and Awesome tables can summarise the data and provide searching and filtering.